Two guide trips today got home late, shore lunch to get ready for tomorrow, part of my evening routine, phone calls, respond to e-mails lastly look at Lake Link. Had no intention of doing a post and usually stay out of anything controversial had a hard time not commenting. Tom502 don't know if we met, you are a wise man, callum like you seeum. Mufugger with a handle like that I sure wouldn't pm you any information. Tom502 back to the bass, I can count the largemouth we've caught on the big water side of the flowage on one hand. The last week in July (this year) we caught a 19",16" and had a big one on that got off, I was surprised. I recently had the pleasure of guiding a young man who will be fishing the bass tournament. He called not knowing me, it turned out I know his dad very well. He was up doing some prefishing in the summer and had four bass he figured weighed 20lbs, one 23-1/2", all largemouth. He showed me where he caught the fish I was surprised but it wasn't in areas I summer fish. There are more largemouth in the flowage then I knew about. Largemouth are a great game fish and a lot of fun to catch. Their presence to me on the TFF however is very troubling, I've guided a lot of people the last couple years who came from the Chippewa flowage to the Turtle because they said the walleye fishing has been on the decline, they feel because of the increase of largemouth. 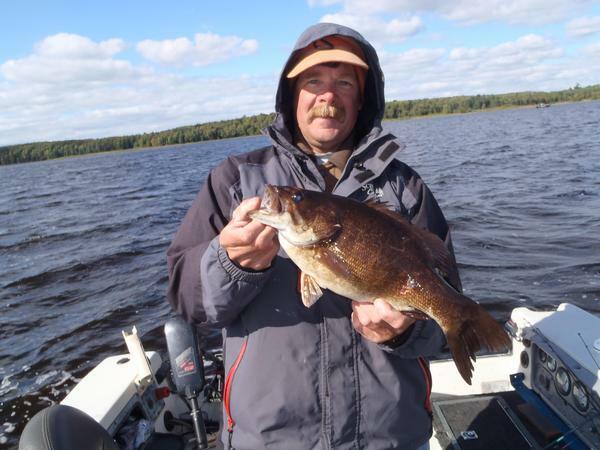 I see the tournament as a very positive event for the flowage. It will possibly give a great assessment of the largemouth population in the TFF. If there are largemouth these guys will catch them. I don't know much about largemouth, a detriment to catching them could be some pretty cold water temps by the first week in Oct. I will be very interested in the catch. I do know a little bit about smallmouth, the picture is from yesterday.